Snacking and the family does not have to be taboo even if you are trying to eat healthily. It is fairly easy to come up with tasty and imaginative snacks that all your family will enjoy but which will also do them good. Snacking does have a place and there may be members of your family who need to snack. If, for example, your healthy eating regime has extended to all areas of your life and one of the adults has given up smoking - they may want to snack in place of smoke. In this case, you would certainly want to make sure that they snacked healthily so as not to cancel out some of the effects of the change in lifestyle. In the case of children, they may want a mid morning snack at school or a mid afternoon one to fill the gap between arriving home and dinner time. Again, the snacks do not have to be a bad thing - in fact they can help to boost your children's fruit and vegetable intake, so can be seen as a welcome boost. There can be no doubt that for snacks, as for many other areas of healthy eating, preparation is the most important thing. When the family comes looking for snacks, they will want something which is quick and easy. The same goes for when the children are at school - why would they out themselves out if they can just buy a chocolate bar? So, make sure you always have crudités and vegetables sticks already cut up and in the fridge. So, this way, when someone opens the fridge declaring their hunger, they only have to fetch out the snack, just as they would an unhealthy one. No-one is going to want to snack on plain pitta breads, however healthy they may be. Part of the fun of a snack is that it tastes nice as well as tides you over until the next meal. So, if you are going to tempt your family members with healthy snacks, you must make sure they are tasty. When chopping crudités, think about using different types of veg. Celery and cucumber may be easy, but can get boring, try adding some different coloured peppers or carrots as well. You can always add a dip such as houmous or a homemade salsa, to liven things up even more. Fruit is an easy snack to hand out, but think of variations on this theme. Dried fruit is tasty and excellent for popping into a lunchbox or giving the spouse. That way, they can keep it on their desk and eat throughout the day. The beauty is that it does not need refridgeration either. If your family have more of a savoury tooth than a sweet one, then think of nuts and similar types of snacks. Health food shops all stock a great range of snacks of varying degrees of healthiness but even a bag of Bombay Mix is better than deep fried crisps. Snacking does not have to be an unhealthy habit. In fact, eat little and often is a mantra often used by health food experts. This means that your body is given several smaller shots of energy throughout the day instead of being overloaded three times. 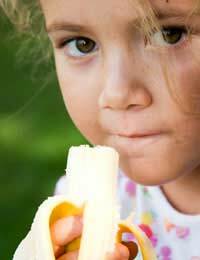 Fruit like a banana in your child's lunchbox that they can eat in the afternoon, will give them the necessary shot of energy to keep them going all afternoon and be more mentally aware until home time.